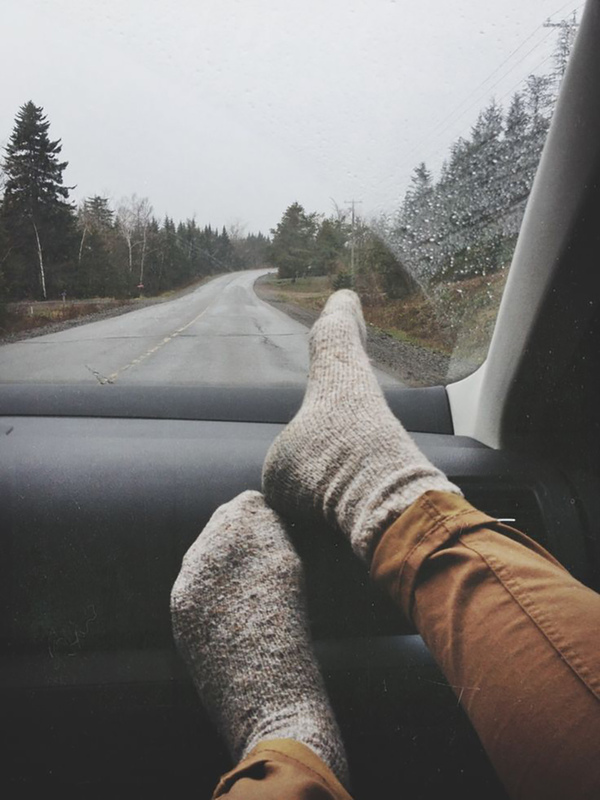 Are You A Good Road Trip Passenger? Over the weekend, we decided to head to Long Island to stay with some good friends of ours. Their home is stunning, and we had the most relaxing time. Since I don’t drive, Peter drove us out. Lately, I’ve been making an effort to be a better passenger; no complaining, no bright phone screen, and no sleeping! I fall asleep as soon as a car starts to move-just like my kids. In all of our years together, Peter has never complained about my sleepy habit. But, in an effort to change, I’ve been trying to be more helpful with road trips. During this trip, I fell asleep on the way there, with the kids. But on the way back, I stayed awake! I’m really proud of myself, even though it’s all rather silly. Peter said the trip felt much easier because I stayed awake; which made me feel excited and a bit nervous. How will I keep this up for every trip going forward? What do you do to stay awake during road trips? We have another trip very soon, and I would love some tips. Hi! I have the same problem. What I do is suggest coffee breaks; chew so gum and I try to listen to upbeat music. Sometimes I choose new albums, so we can have something new to talk about. A kiss all the way from Portugal. Being a good navigator is so helpful. Knowing how to read a map and being a few steps ahead helps. Sometimes the Google maps sends you on a round about way, it's fun and helpful to figure out how to avoid traffic and silly routes. I like to do the driving because if I'm awake and not sleepy I feel nauseated. This may sound silly, but GAMES! If your kids are awake it helps keep them engaged and you as well. Simple things like "let's look for an American flag" or "let's hunt for garbage trucks". It's amazing how time can fly when your brain is engaged in an activity like that. Haha, I have the same problem. I've gotten better at it over the years as I've made a more conscious effort to stay awake – my husband hates having to drive "alone" while I'm sleeping. But it's so hard…and I'm so TIRED. Haha. I have the same problem. Talking helps. Just keep talking, not only are you keeping the driver awake but, you're keeping yourself awake as well. Lol! My boyfriend has that problem, he falls right asleep as soon as the car starts rolling. I suggest grabbing your favorite music playlist, something you and your family can get down to in the car, though you'll all look nuts from the outside, it'll be something to laugh and talk about later. Or, take a detour where you guys can stretch, eat, go site seeing and take some photos! We love road trips, and one thing I've learned in all the driving we have done as a married couple with four kids is talking to keep us awake, play I spy, or road games with the kids (if it's still daylight), and drinking lots of dr. pepper! When my husband and I take turns driving we will listen to either 70's, or 80's music to keep us awake! Born in the 70's, and raised in the 80's so yeah…that's my generation of music! And it keep us going! I have a girlfriend who reads books to her husband while they drive. I haven't tired that as reading in the car makes me a bit car sick but we listen to books on tape together. We listened to Haper Lee's Go Set A Watchman on our summer road trip this year. It was read by Reese Witherspoon and was excellent, gave us some great things to talk about and kept us all awake! i find singing along to the music in the car helps! Thanks for your tips! Love the playlist idea! hahahaha yup, we sound the same. I love the detour and scenery idea. Peter grew up surrounded by grass, I think it'll be a great thing to do. I got to learn first! My mom used to do the sunflower seed trick. I've seen Peter do it as well. I'll get on it! I also get really really car sick, so I think listening will be fun. Though, it may put me to sleep! We are both huge fans of music from the 70s and 80s, I think this might work as well! It's funny, I don't we've ever listened to it in the car! Only my husbands favorite songs he listens to over and over again. I'll give this a try. I honestly thing that's why sleeping was so easy for me. I get really car sick, so sleep is a great option. I chew gum now from time to time to help, and also drink seltzer, so it doesn't build up. I think navigating is a great choice. Love all of the feedback. Thanks ladies! !